A member of the Turkish parliament from the pro-Kurdish Peoples' Democratic Party has accused the military of atrocities in Turkey's southeast, claiming they have ‘burned alive’ more than 150 people trapped in basements. 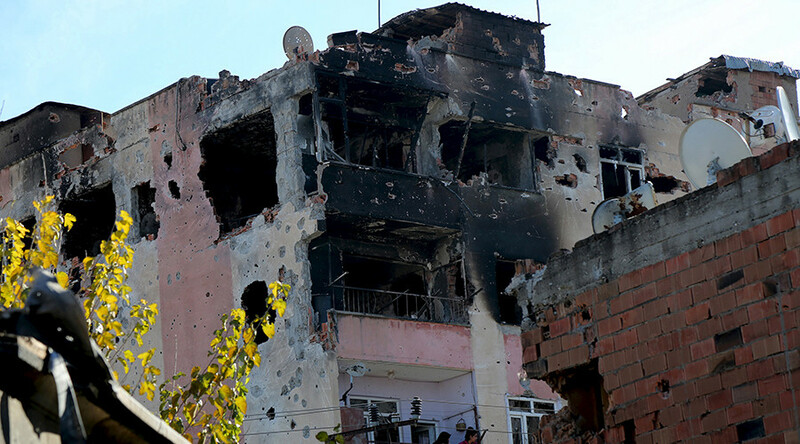 "In the Cizre district of Sırnak, around 150 people have been burned alive in different buildings by Turkish military forces. Some corpses were found without heads. Some were burned completely, so that autopsy is not possible," Feleknas Uca told Sputnik, adding that “most” of those killed were Kurds. While Uca’s statements have not been confirmed by RT on the ground, or independently verified by a third party, the MP warned that more people could face a similar fate as more than 200 people remain trapped inside buildings across the region. "The situation in Diyarbakir is terrible. Its district Sur is seeing its 79th day of curfew. Two hundred people were trapped in basements and Turkey’s special forces won’t rescue them," Uca said. Turkish security forces have been trying to clear southeastern towns and cities of PKK members since last July, when a two-year cease-fire collapsed. Dozens of civilians continue to be trapped in basements in the Cizre district of Turkey’s Sirnak province. Despite an official announcement that the military op was concluded last week, the curfew remains in place. The reports of the massacre first surfaced earlier this week when the ANHA news agency, reported the discovery of 115 bodies. 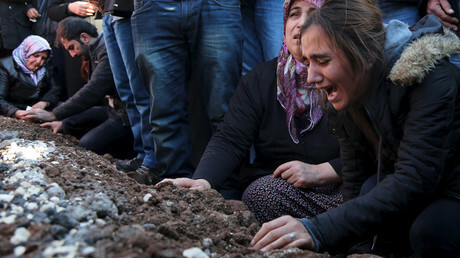 The corpses were so badly burned that relatives were only able to identify 10 out of the 115 bodies found in the Sur and Cudi neighborhoods of Şırnak’s Cizre district. According to the report, DNA samples were taken from the victims to identify the bodies. The Todayszaman newspaper reports that as of last Thursday the Cizre State Hospital morgue had no space for bodies being brought in and they had been sent to other morgues in the region. Also, last Thursday, Interior Minister Efkan Ala confirmed that targeting of the PKK in Cizre had been completed. On Sunday, the Turkish Armed Forces (TSK) announced the discovery of 31 bodies during searches in six buildings in Cizre. The army also said the military operations in Cizre, which started on December 14, had killed 659 PKK members. Yet despite the completion of the operation, wounded people are reported to be still trapped inside basements. Kurdish Netherlands-based ANF News is reporting that DIHA correspondent is trapped with some 30 people underground, with women and children among the wounded awaiting medical treatment. Some are in critical condition. Last month the Turkish Human Rights Foundation said more than 160 civilians had been killed since Ankara's launched its crackdown on the PKK in August. Among those killed are 29 women, 32 children, and 24 people over the age of 60.